French President Francois Hollande is seen through the glass door after a security meeting at the Elysee palace in Paris, Nov. 14, 2015. French President Francois Hollande is under pressure to change policy in Syria's civil war and work more closely with Russia after a wave of deadly attacks in Paris but he seems determined to stick to his guns and escalate military action. France has become arguably the most exposed Western nation to Islamist militants because of its activism in the Middle East's many conflicts, and its rigorous secularism at home, while the United States and Britain - burned by their experience in Iraq - have taken a more cautious approach. Hollande's response to Friday's attacks was to declare that France is at war with Islamic State, which claimed responsibility for the Paris carnage, and to launch a major air strike on IS targets in its Syrian stronghold of Raqqa. While vowing national unity, his conservative opponents criticized the Socialist president for ostracizing Russia, shunning Iran and insisting that President Bashar al-Assad must go as a pre-condition for any Syrian peace settlement. He has also faced criticism from within his own party. "We must draw the lessons on the situation in Syria," ex-president Nicolas Sarkozy, leader of the main center-right Republicans party, said after meeting Hollande on Sunday, calling for "an inflection of our foreign policy". Former French President, Nicolas Sarkozy, leaves the Elysee Palace after a meeting with France's President, Francois Hollande, right, in Paris, Sunday, Nov. 15, 2015. "We need everyone's help to exterminate Daesh (Islamic State), notably the Russians. 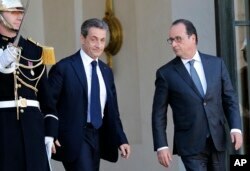 There cannot be two coalitions in Syria," Sarkozy told reporters. Within the French foreign policy establishment, some veteran diplomats accuse Hollande of pursuing a "neo-conservative" foreign policy at a time when the United States and Britain have pulled back from foreign adventures. Like other Western powers, Paris has distanced itself from Russian President Vladimir Putin and joined sanctions against Moscow over its annexation of Crimea last year and its role in destabilizing eastern Ukraine. Hollande scrapped the sale of two warships to Russia which Sarkozy had initiated while in office. Putin's intervention in the Syria conflict last month with air strikes on anti-Assad forces, including "moderate" Islamist groups armed and trained by the West, wrongfooted the French and U.S. governments. The renewed policy debate in Paris echoes similar arguments being thrashed out in Washington and London. Republican U.S. presidential candidates are demanding much tougher action against IS than President Barack Obama has undertaken so far, while British Prime Minister David Cameron is struggling to convince lawmakers to authorize British participation in air strikes in Syria. Unlike the United States, France has generally had a bipartisan consensus on foreign policy and the differences over Syria policy may be less deep in France than they appear. French officials say Paris was left high and dry when Obama reversed course and canceled a plan to strike Assad's forces in August 2013 over the use of chemical weapons. French warplanes were ready on the runway when the word came from Washington that the U.S. president had decided against action. "We wanted to go all the way in 2013, but in the end we got slapped by Barack Obama and we found ourselves alone," a senior official said, speaking on condition of anonymity. "We lost influence and now we don't really see how to move forward there." Paris recently joined coalition air strikes in Syria after more than a year of bombing in Iraq. But until last night it had carried out just five strikes, mostly to try to ensure a seat in any negotiation, officials acknowledge. Just before the Paris attacks, Hollande ordered the aircraft carrier Charles de Gaulle to the eastern Mediterranean. 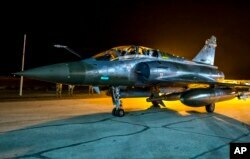 When it arrives in early December, it will treble French air power in the region to 36 aircraft. In a sign of how Hollande may proceed in the coming weeks, some 10 French fighter jets struck multiple targets at Islamic State's Syrian bastion Raqqa on Sunday night. Officials say it's unlikely Paris will put boots on the ground, although it could, like the United States, deploy special forces. The government's critics say France should be working with Moscow, Tehran and Damascus for a political compromise. Former center-right Prime Minister Francois Fillon said it was time for France to "get over its vapors about Russia, understand that we need to work with Iran and even agree to work for a while with the Syrian regime". Veteran experts in the ruling Socialist party, such as former Foreign Minister Hubert Vedrine, are also urging Hollande to shift to a more "realist" approach. "The principled position that Assad must go because of the atrocities committed since the start of the civil war... is understandable and respectable, but perhaps it can be turned into a form of leverage in the (diplomatic) process which is just starting," Vedrine said before the Paris attacks. "Let’s not forgot that when we fought Hitler, we had to make an alliance with Stalin who had killed more people than Hitler." More radical critics accuse Hollande of having exposed France to mortal danger with a string of military interventions since 2013 in Mali, the Central African Republic, Iraq and Syria, while building privileged ties with Gulf Arab states that are widely suspected of funding Jihadi groups. Former Prime Minister Dominique de Villepin, a conservative Gaullist who won global celebrity by denouncing U.S. plans for war in Iraq in 2003 in a dramatic U.N. Security Council speech, argues that France has "fallen into the trap" of fuelling and legitimizing Islamist militancy. Opposing Hollande's decision last year to join the U.S.-led coalition staging air strikes against Islamic State in Iraq, Villepin said: "We know from experience that this kind of strike cannot produce the result we desire of eradicating terrorism." France, which has Europe's largest Muslim population, has since suffered the blowback with a spate of acts of violence by radicalized Muslims, including January attacks on the satirical weekly Charlie Hebdo and on a Jewish supermarket. "Military intervention feeds terrorism. It legitimizes the terrorists - you're the center of international attention, it gives you status and weight. And it radicalizes others around the world. So it is counter-productive," De Villepin told RTL radio in July 2014. "Let's not forget that we gave birth to the Islamic State," he said. "It's the result of the 2003 war. It's the result of the mistakes made in Iraq, notably by supporting the sectarian, pro-Shi'ite Maliki government and dropping the Sunnis."